Daken is the son of Marvel hero Wolverine. He is heavily trained and brain washed to be the ultimate killing machine and assassin. Wolverine is married to a Japanese woman named Itsu. Whle she is pregnant she is killed by the brainwashed KGB assassin the Winter Soldier. The baby inside Itsu survived possibly due to it inheriting his father's healing factor. This baby is taken by the villain Romulus and raised to become an assassin. Daken lived for a time with another family in Japan but his adopted mother rejected him after having another child. Daken killed that child and his adoptive mother. His adoptive father then commited suicide. Romulus then appear and took Daken to Canada. In Canada he was trained by both Romulus and Cyber. Wolverine learns about Daken from the telepath Emma Frost. Frost tells Wolverine he has a son who hates him and wants to kill him. Wolverine decides to seek out Daken and mend fences with him but not before acquiring Carbonadium Synthesizer (C-Synth) capable of shutting down Daken's healing factor. SHIELD ends up capturing Wolverine in his attempt to get C-Synth. Daken breaks into the SHIELD facility and savagely attacks a defenseless Wolverine. He baddly wounds Wolverine but holds himself back from outright killing him. Miss Sinister is hired by Sebastian Shaw to unlock the memories of Daken they are opposed by Charles Xavier and Wolverine. Miss Sinister attempted to manipulate Daken through false memories but he saw through her illusions and stabbed her in the stomach. When Norman Osborn takes over SHIELD and the Avengers in the event known as Dark Reign he recruits Daken to take the mantle of Wolverine in his Dark Avengers. Daken also joined the X-Men team for a time. While serving the Dark Avengers Daken ran afowl of the Punisher Frank Castle . While the Punisher is able to hold his own against Daken he is unable to overcome Daken's healing factor and in the prolonged fight eventually succumbs to Daken's ferocity. Daken cuts off both of Frank's arms and decapitates him, killing him. Frank's body is found by the legion of Monsters who decide to reconstruct Frank. The group led by Morbius uses the bloodstones to bring Frank Castle back to life. They hope that with his tactical experience they can create a champion to battle a Japanese group that is killing them. Frank is rebuilt with a giant powerful Frankenstein like body. At first Frank refuses to help the monsters but after one of the creatures dies at his feet he changes his mind and helps save them. Frank then goes into full on vendetta mode to kill Daken. 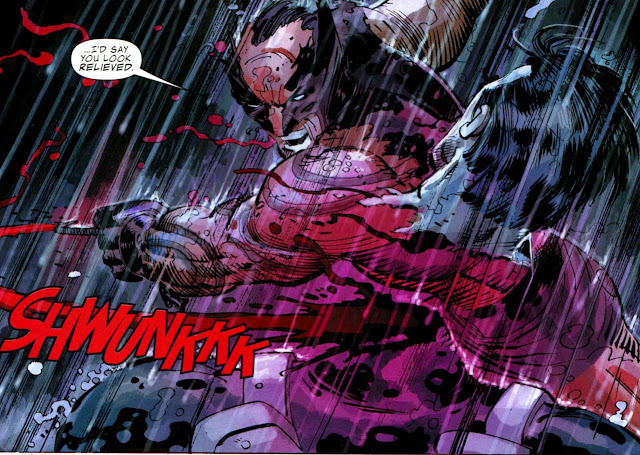 He nearly succeeds after luring Daken into a series of traps and then brutally fighting him, in hand to hand combat. He prepares to drop Daken body into a pit to be buried by asphalt. As he get ready he is stabbed from behind by Wolverine. Wolverine does not want his son Daken killed. During this fray, Daken escapes. Daken slips away with the bloodstones and Franken Castle and Wolverine agree to work together to retrieve them. In the the end the two retrieve the bloodstones and Castle is returned through magic to a normal mortal form ending the age of Franken Castle. Daken escapes to fight another day. 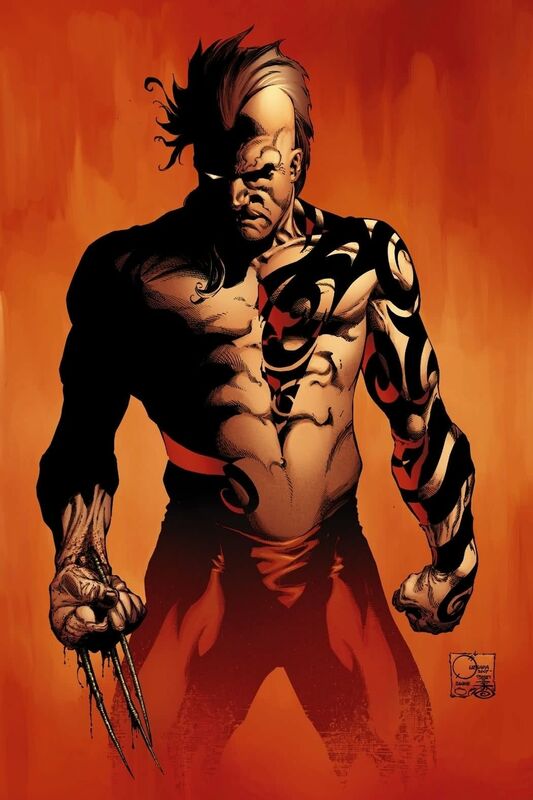 Daken has similar powers as his father Wolverine including feral like rage and an advanced healing factor. He is also heavily trained as an assassin and in martial combat. He was heavily trained in fighting by Cyber. 3 retractable claws 2 from the top of his hand and once from below on his wrist. Daken has not appeared in Fox or Marvel films.